This is the third, and final, instalment on my trip to Italy. And, as is common to blogs, it’s backwards, in that Rome is where our trip began. On the way from the gate where we got off the plane, to the baggage carousel, there were all kinds of the usual retail opportunities that airports offer, and, indeed, depend upon. One of them was for the mobile phone company TIM, that internet research had shown to offer the best value for what I wanted. I bought a SIM card for my smart phone. It cost me 30€ ($46.87) of which about half was prepaid for calls, and the rest for 2G of high speed data (and unlimited low speed thereafter) and unlimited texts for the month. I think. The clerk’s English was barely adequate and all the documentation is, of course, is Italian. I was given documents to sign, and I though I was saying I did NOT want adverts by text. But it was the reverse. I got a daily barrage of incomprehensible offers by text from TIM the whole month. But now I was not dependent on wifi, and could access the internet anywhere. My phone also has Word Lens that is supposed to translate signs and stuff, and was almost entirely useless. I needed something to translate the translations. More than once I was glad of the data link to access Google Maps and sort out not just where we were but what direction we ought to head off in. It also meant that when I booked our trip to Venice, all I had to do was show the conductor on the trains the automated text message the FS system had sent me. 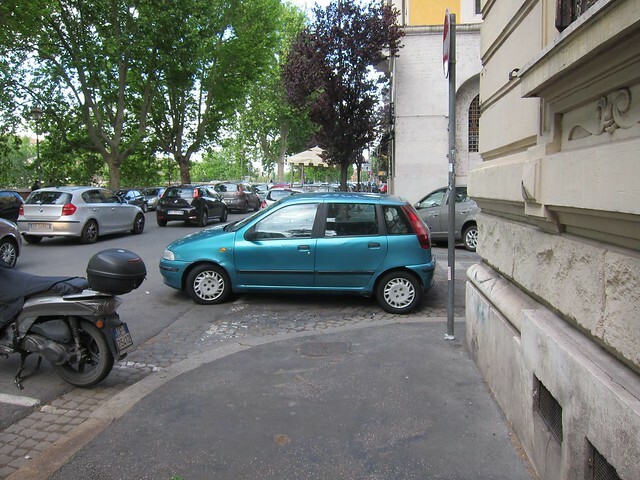 We were picked up from the airport by prior arrangement, and the journey into Rome was one of the scariest experiences I have had in a motor vehicle short of actually being in a collision. Afterwards we solemnly abandoned any thought of renting a car in Italy. This is on the street where we rented an apartment. This car is not pulling out of a side street. It is parked. It is not unusual to see cars parked on the corner. They more usually park at an angle. The corner is usually the only place where there is a space to park. As pedestrians, we found that we were always taking what in a Canadian context would be very risky activity. If you wait at the curb, cars do not stop. You have to step into the traffic to show you are serious about crossing. Even then, motorcycles and scooters will simply weave around you as you cross. Fortunately many roads are narrow and often parked up on both sides. Most urban areas have one way streets, which result in much faster speeds. Testaccio used to be part of the ancient Roman port facilities. It was redeveloped at the end of the 19th century as an industrial area with workers’ housing, and hosted the city’s slaughterhouse. The river was prone to flooding, and the embankment process greatly reduced access to the waterside. 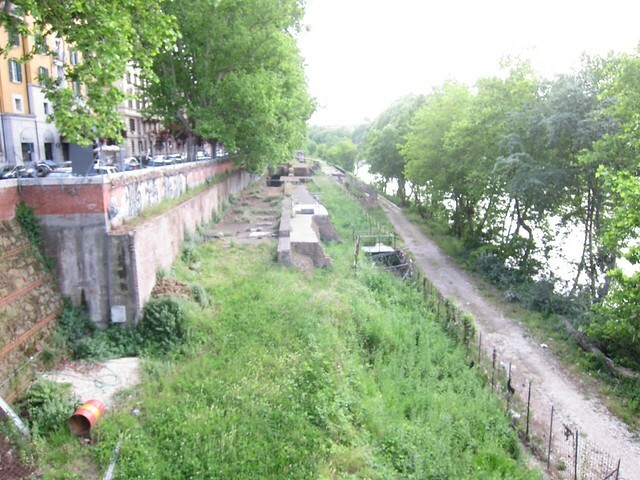 Look at the height of the embankment and imagine that imposed on the Richmond dykes: or the waterfronts of Vancouver. Rome had to face floods every spring as it is surrounded by mountains – as we are. The rich lived on the hills: the ghetto regularly got flooded. That changed at the end of the nineteenth century for them. I suspect that it will have to change for us too, and in much shorter order than we are currently contemplating. 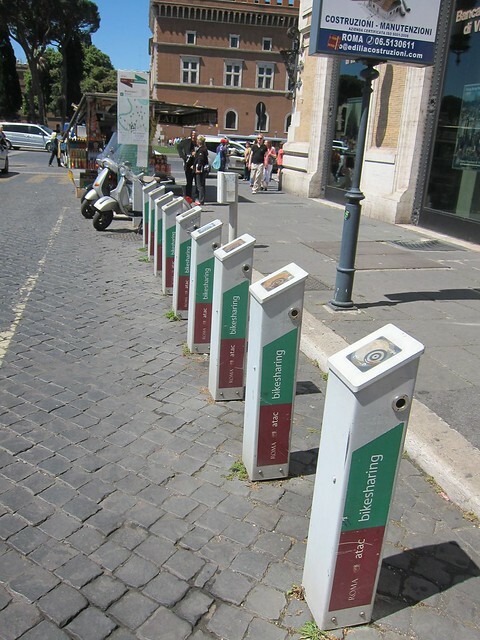 We saw several of these stations, but never any bikes. The only information I can find on line is entirely negative. There were no bikes in 2011 either. Lonely Planet does not mention bikesharing. 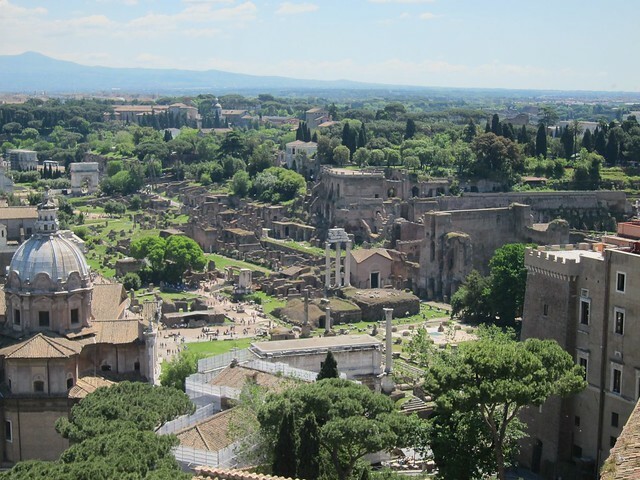 Ancient Rome is still in the centre of the City and most is unrestored ruins. 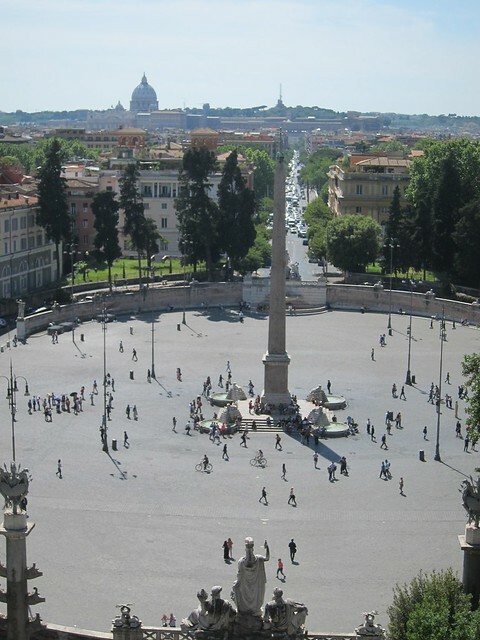 This is the Forum – a view taken from Il Vittoriano. What is very noticeable about this view of the Eternal City is the amount of tree canopy, and the absence of modern high rise buildings. 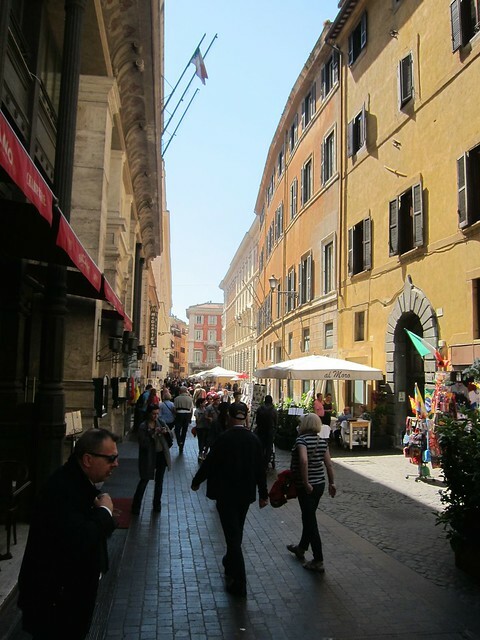 There is a connected network of these streets across the Centro Storico. 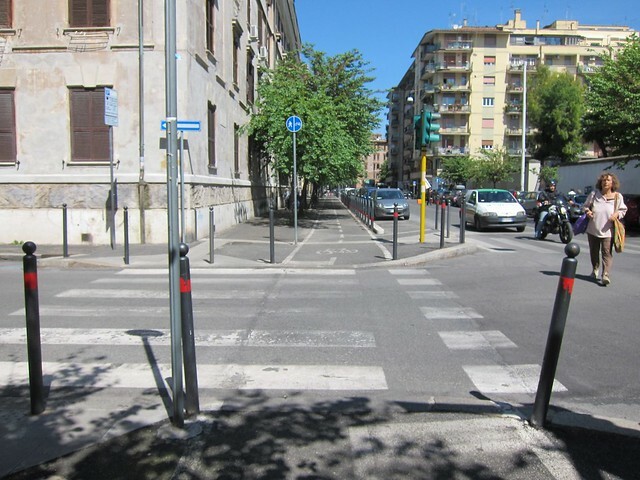 I would like to see greater use of these barriers to car use in more cities. Robson St might be a suitable candidate, with trolleybus activation of barriers/signals. Our neighbourhood had seen some traffic calming with this protected bike lane, and bumpouts for pedestrian crossings. Though you will note the pedestrian taking the more direct, diagonal route across the intersection. I did not actually see anyone use the bike lane, but I admire the vertical stanchions along the curb to prevent any danger of dooring. 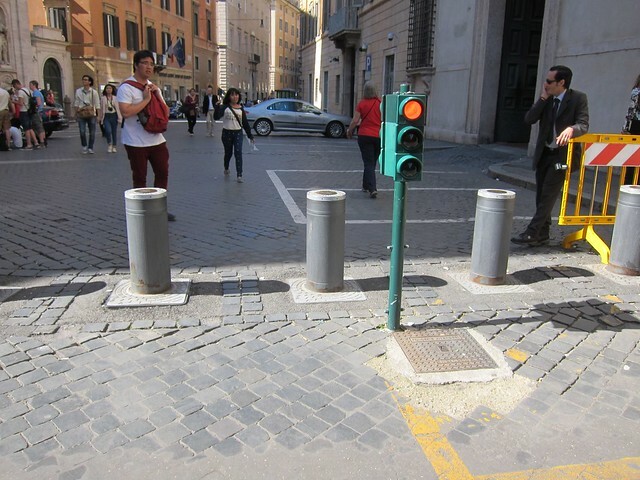 There are many famous public spaces in Rome. Below is Piazza Navona – which was at that time the subject of some dispute between the authorities and the artists who rely on the tourists for their living. Others are very impressive spaces, but seem to serve very little actual purpose. Or perhaps had one once that has now been lost. 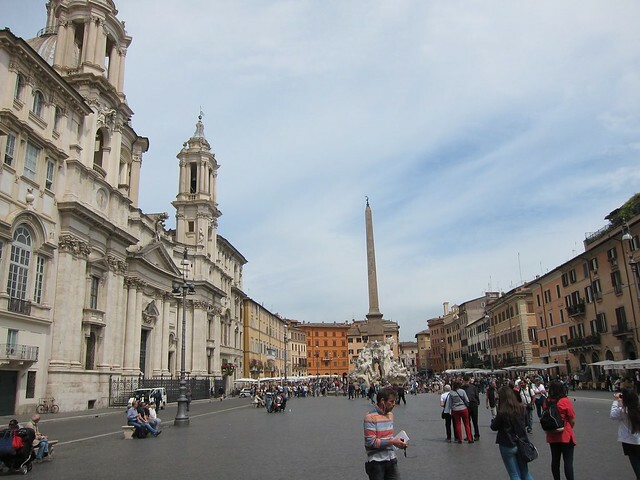 This is Piazza del Popolo, once the site of public executions. At least they managed to keep it clear of traffic unlike the similar Place de la Concorde in Paris. We did use the two line underground Metro. There is a third line now under construction, but progress is slow possibly due to the huge haul of archaeological material uncovered whenever you dig anywhere in Rome. It was reliable in some of the worst traffic disruptions, but not actually pleasant to use due to the crowding and the persistent presence of piano accordion players – some very young children. Begging – and demanding money with menaces at railway stations – is a real problem. We prefer surface travel, but one trip on Tram Number 3 from Piramide (near our apartment) to the Modern Art Gallery at the other end of the line took all morning! Trams do have some exclusive rights of way – but they often have to share them with buses and taxis and seem to have no ability to affect traffic signals. There are two “albums” on flickr of public transport in general and trams in particular. 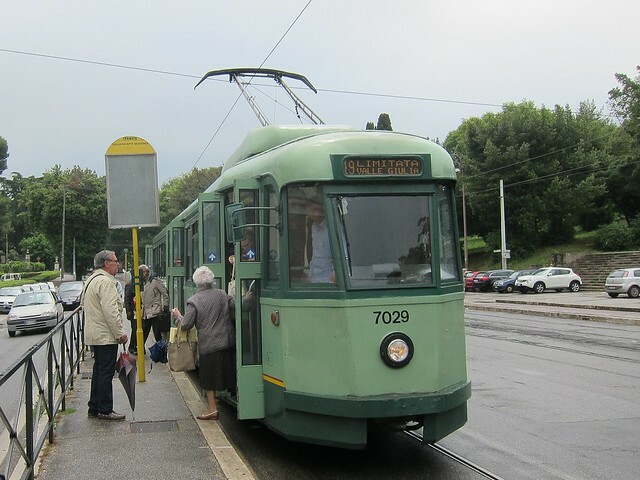 Rome used to have an extensive tram network, but unlike other cities never abandoned it completely and has upgraded some lines in recent years with modern low floor articulated cars and reserved rights of way. 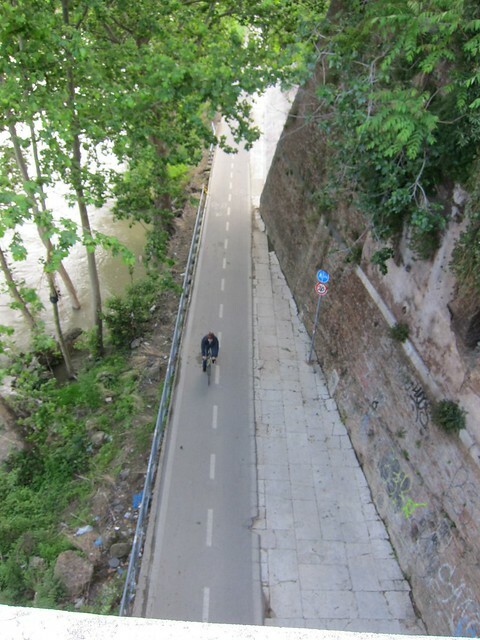 Route 8 through Trastevere is one the better efforts. Our local service, route 3B along Marmorata, was curtailed during our stay due to track maintenance. We did best by choosing some of the designated express bus routes, which simply stop less often than regular services, rather like the B Line. Bus stops in Rome have very detailed information on them about services – but rarely have real time information. And the sale of bus maps is a commercial activity, not a public service. In the event of service disruptions, having a smart phone was no help as no information was available in English. We did a lot of walking in Rome. There are lots of parks – Villa Borghese for instance, which is no longer an actual villa just its gardens. And we were next to one of the nicer neighbourhoods, Aventino, sort of a Roman Shaughnessy. So we saw a lot of a relatively small area, and not very much of the rest of the city, apart from one trip out of town to Ostia Antica (fantastic) – and on a our return an overnight stay in Fiumicino, which is not really worth visiting if it were not for the airport. The biggest issue was the tourists. Many more people are travelling these days, especially those from Eastern Europe who were once forbidden to travel but can now afford to do so. They all want to go to the same places, so the Spanish Steps, Trevi Fountain and Mouth of Truth are beseiged all day. Rome of course still attracts pilgrims. If you are not one of those avoid the Vatican on Thursday mornings when the Pope addresses the faithful in St Peter’s Square and the Colosseum on Mondays when it is one of the few sites that is open. And if you have the guide book and it promises you “secrets” you can bet your life every other tourist has the same guidebook in their own language and is headed the same way. 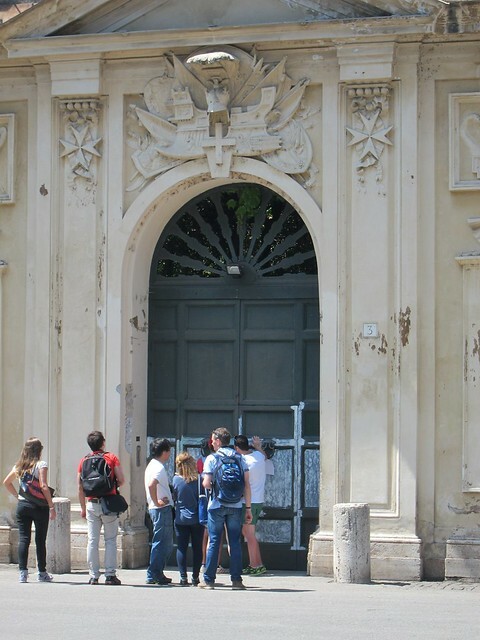 How else to explain the line up to peek through the keyhole of a locked door on a monastery – to get as glimpse of the dome of St Peters, more easily seen from a park a few metres away? You mentioned dikes and rising oceans. I believe I’ve written before here that raising dikes may only be effective to a point considering the underlying soil’s capability of supporting their weight below the surface. I’ve dealt with some projects where the peat was over 20m (60+ ft) deep and fill placed on the surface will sink. Richmond and Delta will likely offer similar conditions, though alluvial deposits may be somewhat more “solid” than peat. Look at the massive piles of preload sand placed on the site of the new development (all auto-centric, BTW) to compress the underlying soils and attain a bit more stability. Seismic loading and liquefaction are also important considerations when designing and building dikes. Pressurized salt water infiltration under the dikes is also something to think about. I’m just saying that there are geotechnical and other considerations that will no doubt pose limitations on diking to hold back the sea. Eventually flood-prone communities may have to address this head on and rise with the tides, as it were, in floating cities.